Photo: David McKeown / Staff Photographer. 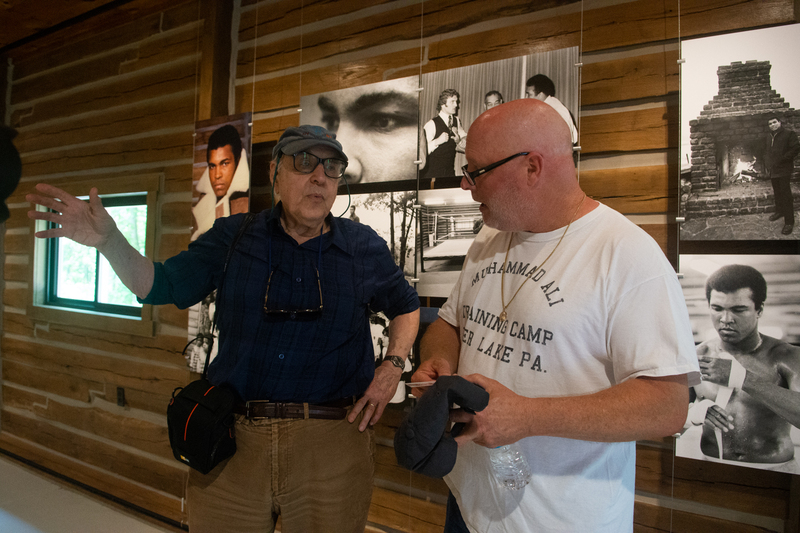 Peter Angelo Simon (left) discusses his book Muhamad Ali Fighter’s Heaven 1974 with the camp’s current owner Mike Madden in Ali’s refurbished gymnasium at a June 1st memorial event, honoring the second anniversary of Ali’s passing. DEER LAKE, PA — Mike Madden’s dream is beginning to take shape. It’s a dream about preserving a piece of American sports history. Madden, son of NFL coaching great John Madden, has been a life-long fan of Muhammad Ali. It’s why nearly two years ago following the former world heavyweight champion’s death and after an internet search indicated that Ali’s former Deer Lake training camp was for sale, Madden bought it. It’s why Madden has begun restoration work to bring the camp, now known as Fighter’s Heaven, back to what it once was. Angered by misinformation he found in stories about Ali’s life, Madden sees his mission at Deer Lake as providing the champion’s legacy as it should be. Ali’s gym at the camp, sort of a training central where he prepared for some of his biggest fights, is the most glowing example of the work that has already been done. Using old photos as a guide, Madden has tried to arrange things as they were when it was the hub of Ali’s activity. A regulation ring is in place, with a heavy punching bag hung nearby. The “rubdown room” off to one side remains a work in progress. Photo enlargements of Ali’s fights along with others of him posing with celebrities, fighters and friends are hung from all four walls, as are plaques with famous quotes attributed to Ali over the years. Among the items gracing the inner walls of the gym are photos of Ali with Ray Robinson, Angelo Dundee, Gene Kilroy and Jackie Robinson, among many others. There are also framed covers of “Life” magazine covers that featured Ali over the years. In one corner is a big-screen television that plays a DVD featuring highlights of Ali’s career. Invaluable through the process has been Madden’s friendship with Ali’s former business manager and Mahanoy City native Kilroy, who also made an appearance at the podium during Friday’s media event. Other work has also been done on several cabins and bunkhouses on the property, but more remains in the future. “We just want to kind of finish what we started,” Madden said. “I want to bring school kids in to see it. In one corner of the gym, affectionately named Kilroy’s Corner, are historical photos from Kilroy’s private collection. “The stuff we’ve done here to date, and the stuff that will be done here in the future would not have been possible without Gene,” Madden said. 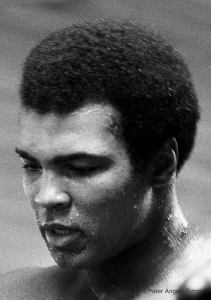 In 1974, noted photographer Peter Angelo Simon spent time at the training camp with Ali, taking literally thousands of photographs. Simon, who attended Friday’s event, said it was his first visit back to the Deer Lake Camp in 44 years. Many of his photos served as inspiration and a factual guide for the restoration project.